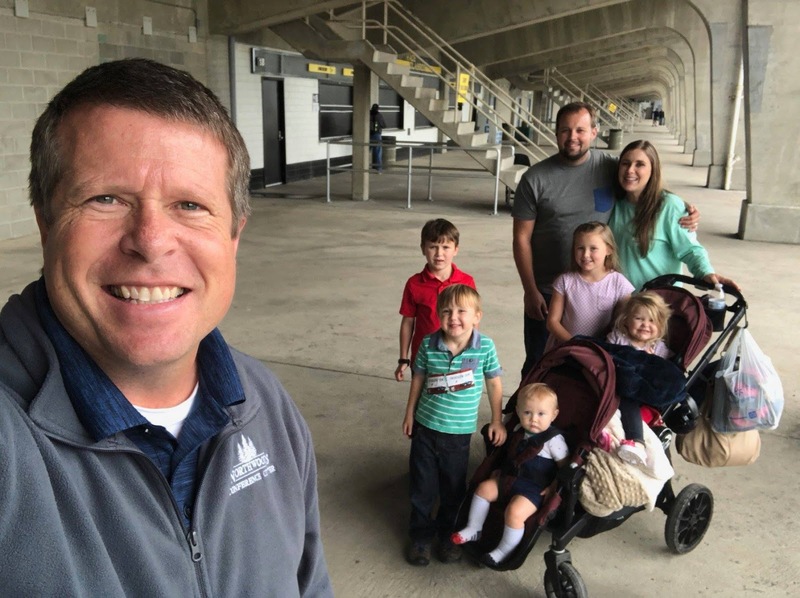 Two weeks ago, Josh and Anna Duggar and their children, as well as Jim Bob Duggar (aka "Pops"), traveled up to Indianapolis, Indiana, for the Brickyard 400 NASCAR race. Have you ever been to a NASCAR race? If you have, you know how loud they are, hence the noise-canceling ear protection that the Duggars are wearing. Nascar is so much fun. We use to go and always had the best time. Can't really seem to make it lately tho because of work schedules but we hope we can get there again soon. Josh and Anna and the kids look so happy. They have such beautiful children and it's nice seeing them again. On my goodness little Meredith makes the cutest faces.lol. It's good to see you again. What a nice looking family you two have!!! It’s great you still post updates of Anna and the kids but please, no pictures of josh. Especially one with a young girl sitting on his lap!!!!!!!!!!!!!!!!!!!!!!! Ugh, I knew someone would say this. He's been forgiven and received treatment. Let's move on. They obviously have. The “young girl” is his daughter and Anna is sitting right there, what do you think he’s going to do? Josh is not a child abuser, what happens when he was a teen was under very strange circumstances. They were being raised basically in a cult like manner in a very small house with very little knowledge of the real world outside of their bubble. Honestly I believe Josh had the mindset of someone much younger than himself at the time, otherwise things would be much different. He was 14 when that happened. I'm not excusing his actions but he was a child. Now cheating on Anna with Adult women is bad but she had forgiven him. You need to get over it. It didn't happen to you. 10:26 -- Josh was a minor when he touched his sisters. Do you want to be held liable for everything you did as a minor for the rest of your life? He's an adult now. I would have thought that yesterday's televised proceedings would have taught us all that what you do as a teenager, you ARE held liable for, for the rest of your life. We really don’t know if he received appropriate treatment OR if he’s been forgiven. I too believe he and his family should be vigilant - a child should not be on his lap. You don't wanna see Josh? Then go away. Wish granted. Love seeing Josh & Anna and their kids. Very nice family picture. It is wonder full to see Josh is in the picture still. Right, in the midst of HIS gorgeous wife and beautiful children. Good to see them . Kids are getting so big! I adore seeing pictures and hearing little updates about Josh and Anna! This makes me smile!! Really? How can you tell with a baby sitting on her lap. She does not! She looks her normal slender self! You should not say that because it's an insult to someone if they are not! I'm sure you wouldn't like someone telling you the same thing! I think it is terribly insensitive and underhanded to criticize the way someone looks or the way they dress. That is just plain mean-spirited. It Anna is pregnant that would be a good thing. She is a good Mom from what we see so if she is then congratulation. As far as her looking pregnant, I can't tell from the picture. It's so refreshing to see Josh and Anna and the kids. They look like the Duggars we had come to know. They seem so humble and sweet. I have a strong suspicion that Josh and Anna and their children are the biggest blessings to those around them. We love them and hope we always get updates on them. Their children by the way are absolutely gorgeous!!! I doubt Josh is the biggest blessing to his sisters. His actions also cost the family the cancelation of 19KC. I think they're probably the biggest encouragement of Gods unmerited grace to those around them but biggest blessing ?? I'm sure Josh' siblings own partners and their own children are their biggest blessing not Josh & family. Such a strange comment. I am sure that each Duggars biggest blessing are their own spouses and kids. As far as JB and Michelle I am sure they love all their kids and grandchildren equally. Pops doing a selfie. No telling who else was in the entourage. I'm guessing JimBob may be an accountability partner during continued healing time. Are you saying that Josh can't be accountable for his own actions, and that Anna needs help from her father-in-law to handle things? That comment doesn't make much sense. Love Nascar!!! So nice to see Josh and Anna and those beautiful children. Did they stop at a thrift store on the way? What are all those bags doing hanging from the stroller? If you have to haul that much stuff to a race...?? 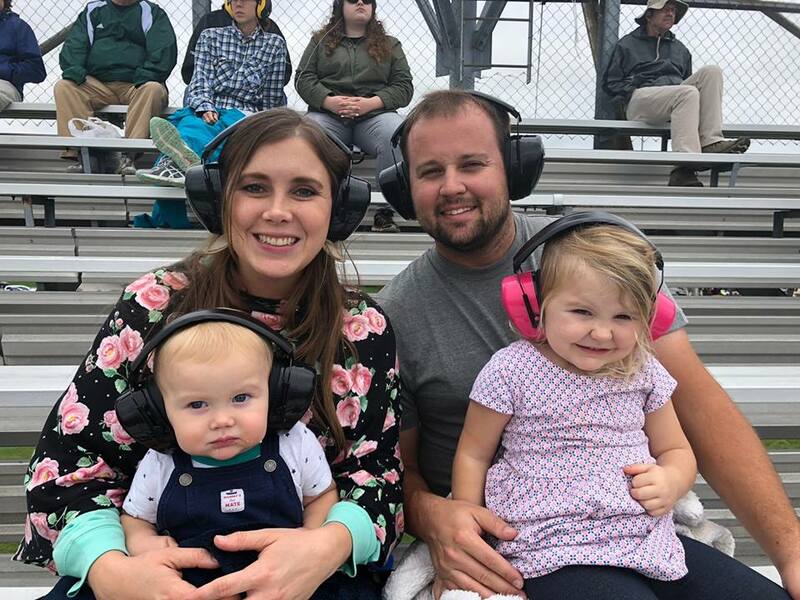 I question if you have to haul little kids to a race, too, and make them sit in the stands with headphones on. What little kid is interested in big noisy cars driving around and around? You could sit on the side of the highway and see the same thing. It looks like she packed jackets and blankets. When you have 4 kids, you can never be over prepared! Well considering there are 7 people in that family and Anna is a caring mom, that is not too much stuff for their day out. I've been to a NASCAR race. It is considered normal to have bags of things. There is a time and place to "buy used, save the difference". A NASCAR race is definitely not one of those events you can apply that rule too, LOL! Hearing protection, diaper bags, sweater or jacket for each, snacks, bottle, drink boxes. That's what a day out with 5 small children requires!! Why is what they pack, or don't pack anyone else's business? Why does it matter if Anna is pregnant or not? Why is it so hard for people to accept that she forgave her husband? Why do people constantly feel the need to tear this family down? You like the Duggars? Fine. You dont like the Duggars? Fine as well. If you cant say anything nice, think a little longer before you speak. It is frantic scolding rants like this that egg in the trolls to say ridiculous things to elicite this kind of response. The trolls have no reason to hold back their opinion. They are not trying to be nice and they really don't have to because they are anonymous. @8:01 PM - The family makes their business everyone else’s by going on TV, sharing public photos, selling magazine exclusives, and writing endless public blogs. If they wanted to live as private people, it would be easy to do so. Well then what is with the bags? Looks like if you took the kids out, the stroller would tip over backwards. Wow Josh and Anna's kids are getting so big!! They are a nice looking family! I don’t know. That guy is untrustworthy and seeing him out in public is scary. Ok this is plain ridiculous. You don’t know how many guys you walk by that has done this very thing and much worse. Are you going to avoid public altogether? That’s so neat they can spend one on one time with “pops”. Glad Jim bob can get out and enjoy family by family like this. This blog never reveals the wedding date of a Duggar. There may be a “Guess the Date” encouraged by TLC which I find abhorrent because it’s like saying the fans are not in any position of privilege to know; but, maybe they can be placated by a game of guessing. Sure it’s going to be the best wedding yet. I'll bet the reception is in an airplane hangar. i doubt they'll get married the first weekend in November. That is Jinger and Jeremys anniversary and Jessa and Spurgeons birthday. PLUS Ellie let that comment be posted, meaning if it truly is that date, the comment would not have been posted. I can't help wondering if Jana will ever be interested in getting married. I wonder if she's maybe just happy being solo nothing wrong with it I'm a 50 yr old female never married and just fine. Just saying I'm curious if it's her desire to remain single. I just don't see her getting married honestly. Nothing wrong with it. My best friend is 40 and not married. She is very happy. Jana has often spoken about her relationship status and been open that she would like to get married if the right guy comes along, which she’s said he has not yet. While you might be happy at 40 or 50, let me tell you this. It's rough going into the twilight years without someone beside you. As bodies weaken and things start to fail, you need someone who can support you emotionally and sometimes physically, too. If you don't have a spouse, do you have a friend willing to sacrifice time and energy for you? I know someone in her late 50's who never married. We've talked about this. All we could do is come to that brick wall of "what if, someday, you need..." and we leave it there. I don't know how she plans to cope later, and neither does she. She doesn't have the money to move into a swanky retirement home where physical things are taken care of for you. She has no spouse or children to help with the emotional things. Old age can be a beast. Anon 10:33. I can answer that question. I'm married but even in marriage there is no guarantee that either I or my husband will be there for each other because one of us can be taken years before the other. But I go by what I see and I have Aunts and Uncles who never married and also know other people who are older who never married or are widowed and we reach into their lives being younger then them and are always willing to help. We all invite them to Spend Holidays with us, go places with them, pick them up to take them to Church with us, take them to Doctor appointments etc. We should always be a society and a people where no one gets left behind no matter their marital status or age. My unmarried Aunts and Uncles are awesome and all of our children just absolutely adore them. anon@10:33- Just because you get married is no guarantee your spouse will be by your side throughout the twilight years. My mother outlived my dad by 25 years and my sister was widowed twice before she turned 55. Also, I think it selfish to have kids with the intention that they'll take care of you in your old age, or help with the financial end of things. Many times, families are scattered and are not in close proximity to be there regularly. Your friend's situation is a good example of why women need to take stock of their financial situation at a young age, and prepare for the time when they will likely need skilled care. A lot of people go through their savings very quickly in nursing homes and end up on government assistance. My mother was paying over $6,000/month for memory care. Fortunately, she was a good money manager and passed away without breaking the bank. Sometimes life knocks you around so hard that you don't get the chance to have any money to manage, 3:39. But you don't need to spend anything to develop strong relationships with your spouse, your children, and your friends. Don't forget to invest in those, too. The first thing that comes to mind with Nascar are those new skimppily dressed monster energy girls who stand next to the winner. Seriously, they let more hang out then cover up. It is awful! I wonder what Anna thought about those girls. I hope she covered Josh's eyes and yelled nike. That would be a moment I could see worthy of the word. Especially, if they had no idea those girls are part of Nascar. I've wondered about the Duggars and all those Arkansas sports games they go to, too. Girls wearing tiny uniforms, doing athletic moves and dance moves. Why is that OK to watch? More things that make you wonder if the Duggars really practice what they tell others. Good to see Anna and Josh smiling again. I pray everything is working out for them and their beautiful young babies. So sad I didn’t see them. I was there a couple times this has happened now that they have been at the same place as me at the same time and I have not seen them. Lovely family. God Bless All. I'm sure I have been slow to pick up on this, but I think I'm seeing that Anna appears to have braces? Her smile is beautiful...always has been.